Brentwood Board of Aldermen decisions that affect residents, as well as elections are covered. After the city of Brentwood’s waste processor closed its recycling center on last year, the City of Brentwood had to find another materials recycling facility. In the time that followed, it appeared to a city employee (who contacted 40 South) that the city was simply taking all the residents’ recycling to the dump. Brentwood resident, Robin Duntze, emailed several aldermen, asking for an explanation. See Alderman Andy Leahy’s response here. Yesterday Brentwood City Administrator Bola Akande also responded. In the past Brentwood has used a city-owned 2008 Chevy heavy-duty dump truck to tow the city’s band wagon, which weighs approximately 17,000 pounds. The city points out in the agenda that the truck wasn’t specified for pulling a bandwagon. Taking into account the weight of the truck and the wagon, the combined weight could cause damage to the truck. The staff recommends selling or trading one of its current trucks and buying a new one capable of towing the bandwagon. The cost would be approximately $90,000. 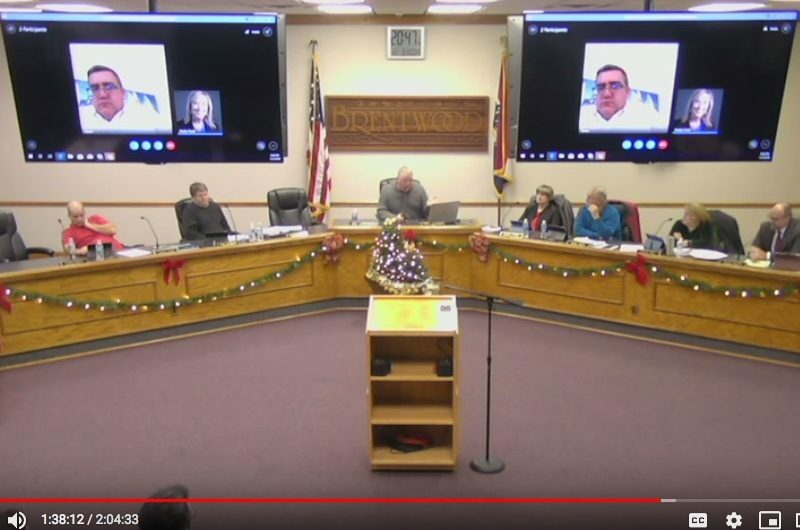 Brentwood aldermen on Monday approved the city’s purchase of the property directly east of the firehouse, which will be used to add an elevator shaft onto the building and also handicap parking spots in order to make the building compliant with the Americans with Disabilities Act (ADA). The purchase cost of the property is $200,000. City officials determined at the previous open meeting, on May 10, that the firehouse doesn’t comply with the ADA because there is no way for handicapped people to get to the second floor. It needs to comply with the ADA because it is a publicly owned building, the city attorney said. In the first hearing all but one alderman voted to buy the property at 8746 Eulalie Avenue. The Brentwood aldermen in a meeting Monday night voted to decline an award to the city announced last week. The 2018 Innovation Award from the Missouri Municipal League, was in recognition of Brentwood’ use of GPS tracking to improve the delivery of public safety services. Brentwood alderman, Brandon Wegge introduced the measure on Monday, saying the city’s application for the award had caused a lot of questions. According to the application, submitted by City Administrator Bola Akande, the city worked with the company, Geocompile, to develop software to make it possible to track the location of each of the city’s vehicles. Geocompile is owned by Brentwood Mayor Chris Thornton. Recently, the Missouri Municipal League (MML) awarded its 2018 “Innovation Award” to the City of Brentwood for its “Technology to Improve Public Safety”. Essentially, it’s a “data collection and analysis system to analyze the data from the GPS units.” (See Brentwood’s Application, “Project Summary”). Though the city of Brentwood has said that it has no relationship with the company, Geocompile, LLC, the city began partnering with the company in June 2016 to implement a GPS tracking system for all city vehicles, according to the city’s application for an innovation award with the Missouri Municipal League, which the city won this year. Geocompile, LLC, is owned by Brentwood Mayor Christopher A. Thornton, at 2533 S. Brentwood Boulevard, according to the Missouri Secretary of State. Thornton and the city has not responded immediately to a request for a comment. See a PDF of the city’s application for the award, obtained from the Missouri Municipal League. deputy city clerk: Thank you for your Request for Public Records. At Monday night’s Brentwood Board of Aldermen meeting, officials voted to allow the city to buy 8606 Manchester Road, “for the purpose of enhancing protection against flooding, revitalizing the critical commercial corridor of the city and in order to protect the health, safety and welfare of the people of the city of Brentwood,” according to the ordinance. Mayor Chris Thornton has proposed that the city consider a plan to mitigate flooding on Manchester Road from Deer Creek. See the most recent study about the problem here. The officials also approved a temporary parking lot at 8212 Manchester Road. Brentchester LLC bought the lot in 2014 from Joe & Joes Enterprises LLC for $80,000 according to St.
Before laying off four administrative staff members in a reorganization on Nov. 9, the city of Brentwood considered laying off six others as well. A chart made by the city on Nov. 8 included 10 city employees whose positions were examined and were considered for release. The four on the left side of the chart were released. According to three different sources, four Brentwood city employees were fired on November 9. All sources said that Brentwood Mayor Chris Thornton and City Administrator Bola Akande told those fired that their services were no longer needed, and their positions were being eliminated. All were long-time employees. He said they were fired “without any prior notice and seemingly without cause.” One said that the Human Resources manager did not know this would occur until it actually happened. Turnout and unofficial results for the November 7, 2017 Special Election have been posted on the St. Louis County website; a local use tax on the ballot in Brentwood was defeated by 17 points. The ‘no’ votes beat the ‘yes’ for Proposition 1 by 312 to 218. The issue would have authorized Brentwood to levy a 1.5 percent use tax on purchases from out-of-state vendors who are exempt from local sales tax. It would also have applied to internet purchases over $2,000 per year by individuals when self-reported on their state income tax returns. The City of Brentwood has placed Proposition 1/Use Tax on the Nov. 7 ballot for residents to decide, according to the city. A use tax is levied in many cities and by the state of Missouri on out-of-state business-to-business and internet sales. The ballot issue would authorize Brentwood to levy a 1.5 percent use tax on purchases from out-of-state vendors who are exempt from local sales tax. The tax would also apply to internet purchases over $2,000 per year by individuals when self-reported on their state income tax returns. The city of Brentwood is seeking a new chief of police, according to a Sept. 22 posting on the city website. 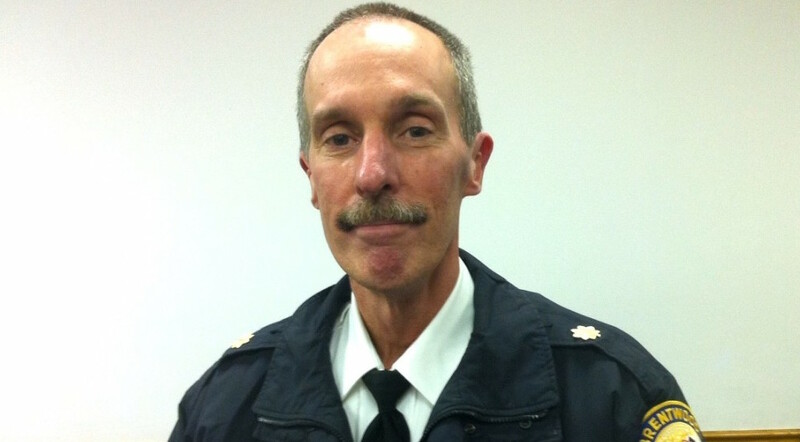 Police Major James McIntyre was named interim chief of police when then chief Dan Fitzgerald retired in April 2017 to accept a position as associate director of CYC sports with the Archdiocese of St. Louis. Former Brentwood mayor, Pat Kelly, appointed Fitzgerald in April 2014, replacing Steve Disbennett, who had retired in February that year. Brentwood Planning and Zoning last week considered a request for a custard shop at 2301 S. Brentwood Boulevard, at the corner at Brentwood Boulevard and White Avenue, according to the meeting agenda. Brentwood Mayor Chris Thornton owns the property, doing business as Three Monkeys LLC according to state records. Thornton had previously planned to build a new office for his wife, Pam’s, insurance business. Plan and zoning considered a 909 square-foot drive-thru custard shop with parking. The new shop will be called Monkey Business Frozen Treats, according to the site plan. The Missouri Municipal League has recognized the city of Brentwood for “Alternative Sidewalk Slab Repairs.” According to the Missouri Municipal League (below), in the past, sidewalk slabs lifted but not cracked by tree roots were removed and new ones were poured. This year Brentwood Public Works used a process to lift and level the existing slabs instead of replacing them, saving time and money. The city of Brentwood plans to clear three houses that border City Hall so it’s not “landlocked,” according to Brentwood Assistant City Administrator Lisa Koerkenmeier. The public works committee will consider five bids, from $27,648 to $104,487, to remove 8758 and 8754 Rosalie and 8751 Eulalie avenues at its Sept. 13 meeting. The bids will be will be presented to the board of aldermen on September 18. Koerkenmeier said there are no immediate plans for the properties. Brentwood aldermen on September 5 approved a request by West Community Credit Union (2345 S. Brentwood Boulevard) to rezone the two properties to the west from single family residential to planned development, to make room for a new credit union building, plus tenants. The houses rezoned are 8815 Litzsinger Road and 8816 Harrison Avenue, and are set to be demolished. The parcels combined are a total of about seven tenths of an acre. The new building will consist of 9,965 square feet of office space. The credit union square footage is 4,990 square feet, and up to three tenant bays occupying the remaining 4,975 square feet of space are planned. According to the city of Brentwood, Chief of Police Dan Fitzgerald has decided to retire from the city. He has accepted a position as associate director of CYC sports with the Archdiocese of St. Louis. Fitzgerald is been a life-long Brentwood resident. Mayor Chris Thornton and the board of aldermen thank Fitzgerald for his dedicated service to the city and his leadership of the Brentwood Police Department, according to the release.